"The banner looks fantastic. The quality of the canvas, the stitching, and the grommets is excellent. Your follow-through, AND your follow up is second to none, and I've managed a lot of printing projects over the past 40 years." Everything we do at PFL is designed to drive sales. That's why we offer fully customizable vinyl banners, from the size and shape to the personalization of the look and presentation. Don't have a banner designed and ready to print? You've got options! 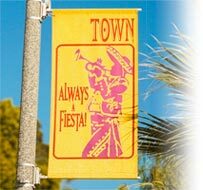 Go big and bold with your message on PFL's high-quality custom vinyl banners. These durable banners are great for trade shows, sporting events, store fronts, grand openings, point-of-purchase displays, school events and more. Welcome an incoming class or announce your new location to the world. Think about using bold colors or messaging to really attract attention. Get out there where your customers are, so you can reel them inside to buy! For outdoor or long term use, our durable, weatherproof vinyl stands up to rain and sun like a champ. Available up to 4 feet wide and 48 feet long, you'll have no shortage of space to write your message. But keep it short and simple-readable in under 5 seconds, because that's all you get with outdoor advertising!